Good news !Vpecker E4 Professional OBDII Diagnostic Tablet will come to OBDexpress.co.uk,here is the Vpecker-E4 introduction. Vpecker E4, android based multifunctional diagnostic tool with 8 inch tablet developed by IDUTEX, covering over 78 manufactures from Asia, America, Europe, Australia, featuring powerful diagnosing functions with overall special functions(resetting&coding&programmin g) , data replay, data analysis, It meets the customer’s requirement and would be the best choice for workshops and mechanics. • 8 inch multi-touch screen. • Support multiple 23 languages. • Powerful diagnostic functions and coding/restting/programming. • Work stably and smoothly in high and low temperature environment. • Complete function including live data, ECU programming and so many others. Ssangyong, Subaru, Suzuki, Toyota, Tata, Mahindra, MARUTI. Porsche, Renault, Saab, Seat, Skoda, elegante, Vauxhall, Volvo, VW. Chrysler, Ford, USA GM, Jeep, Scion. GLEAGLE, GWM, HBSH, Huachen, Lifan, Wuling,Yuan..
Porsche, Jaguar, Land Rover, Volvo, Saab, Alfa . An active IDS software license is not found and is required for vehicle communications. 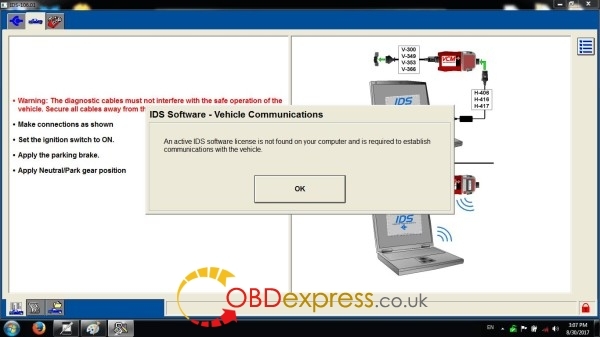 Go to FVDI2 Quick Start, then IDS Ford, then start Ford diagnostics here.